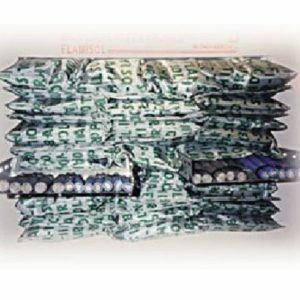 FLAMISOL Bag is a caulking system in the form of fire-resistant bags, measuring 20 cm x 32 cm, made of a glass fabric with very high resistance to impact and tearing. With three different capacities, of 750 g, 450 g and 250 g, it has been tested for up to 2 hours. In addition, it offers chemical stability by maintaining these qualities regardless of weather conditions, the industrial environment and the temperature. In the event of a fire, the expansion of the bag’s components ensures perfect sealing in just a few seconds. 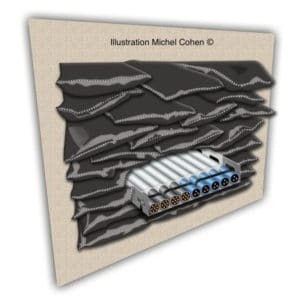 This will prevent the spread of flames, smoke and toxic gases through the cable ducts or all types of technical casing. It is very easy to install and requires no specialist staff or specific equipment. The bags are also easy to remove, allowing the addition or removal of cables at any time. Discover our complementary products to protect building against fire.